Florence E. Culpepper, d. 1 Sep 1969 at 80 years in Crisp Co., GA; Res. 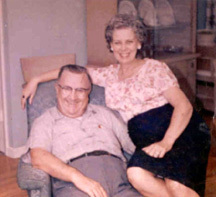 in Crisp Co., GA.
Joseph S. Culpepper was the father of Southern Barbecue and was directly responsible for teaching the relatives of "Fat Boys Barbecue / Sonneys Barbecue" He owned Joe's Barbecu in the 1930s to 1950s, Barbecue Barn in the mid 1950s, and then Plantation Barbecue until his death, at which time there were 10 restaurants. His homemade Georgia barbecue sauce was very famous. H. Hollis Culpepper Obituary, June 23, 2003. Obituary of Bessie Calhoun Culpepper, 16 Aug 2002. David E. Culpepper Obituary, Tuesday, November 21, 2000. - Jessie Hollingsworth Culpepper, wife of J. O. 1894 - 1924. Florida Times Union, 30 May 1924: LDS film 1204581, "Vital Records card file for North Florida and South Georgia, 1895-1945, Jacksonville, FL, Branch Genealogical Library. John O Culpepper Jr., White, Married, born 1917 in Georgia, residing in Crisp Co., Georgia, enlisted as a Private in the US Army on 1 Mar 1944 at Fort McPherson, Georgia. Mr. Morris Pollock died at the home of his son-in-law Mr. William Culpepper, in Wilcox County, on Wednesday, August 20, 1884, aged eighty-four years and three weeks. The remains were buried at the old family burial ground on the place of Mr. D. H. Hendley in Pulaski County, on the 21st inst. Mr. Pollock was one of the two oldest men in Pulaski County. He was one of the original settlers of Houston County, and moved to this county about thirty-five years ago. He was the father of our present Tax Collector, Mr. E. A. Pollock, and also of Mrs. D. .G. McCormick and Mrs. William Culpepper. He was never connected with any church by membership, but in faith was a staunch Primitive Baptist. Ruby Culpepper Hall, Cert 4371, Hillsborough Co., FL, White, 10 Aug 1893 - 01 Jan 1980. William Alford Hall (1837- 1908) and Parmelia Vanlandingham (1847- 1936). Ethel b 1890 married Ira King. Ralph W. Culpepper, Son, M, 1 5/12, S, GA/FL/GA. Nina R. Culpepper, d. 29 Nov 1963 at 64 years in Bibb Co., GA; Res. in Wilkinson Co., GA.
Ralph W. Culpepper, d. 10 Apr 1964 at 68 years in Wilkinson Co., GA; Res. in Wilkinson Co., GA.
Billie J. Culpepper, d. 19 Dec 1977 at 47 years in Wilkinson Co., GA; Res. in Wilkinson Co., GA.
Ralph W. Culpepper, d. 4 Jan 1982 at 53 years in Wilkinson Co., GA; Res. in Wilkinson Co., GA.